[Giveaway is now over - thanks for participating!] It's been a long time since I last wrote about Taco Asylum (and this was back when I was using my mini point-and-shoot!) but new circumstances have called us back to the crime scene where innocent tacos got devoured. Not only is the restaurant sporting a new look and label these days, it has also recently released its revamped and redone menu, lovingly created by their new Executive Chef Carlos Anthony. Once the ownership of the restaurant shifted to full ownership by Ace Patel (instead of partial), the rebranding was imminent but who said all change is bad? We'd say that the refreshed menu is a welcomed direction, especially by the hands of the exuberant and passionate young chef at the helm now who even said himself that "this is the restaurant I've been dreaming of opening." 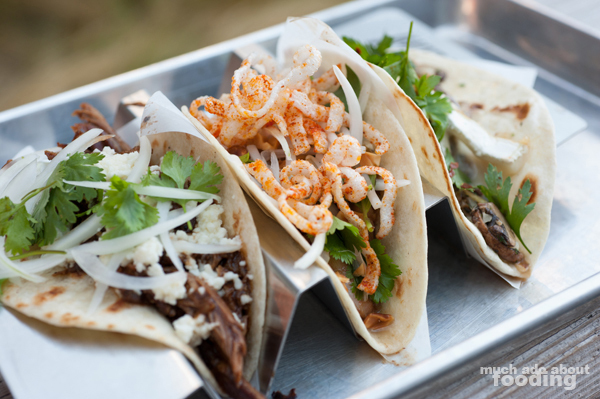 To get an idea of what influence this chef (formerly at San Diego's Searsucker and Michelin-starred Redd's in Napa Valley) had on Taco Asylum, we were invited to taste the tantalizing tacos. The goal was to remake the menu but keep Taco Asylum's original representation of worldly cuisines in taco format. Chef Carlos' influences came from his early childhood days when he would help his mother and grandmother prepare their Hispanic home-cooking so the culinary techniques brought to the restaurant with his hire stem from this history. We saw that touch in every dish that we tasted from the inclusion of one spice/seasoning to the way a certain ingredient was prepared. To start were some of the Sides on the menu. We ordered the Brave Potatoes ($3 - roasted chili-rubbed potato, garlic, mint, parsley, lemon, and fire-roasted aioli) and Corn Off the Cob ($3 - fire-roasted bell pepper, corn crema, onion, and garlic) which both came in reasonably sized portions for their prices. The potatoes were just a tad chunkier than we both preferred, especially because its rub on the outside and roasted surface was so crisp already; the thickness nearly overtook that pleasant first bite and crunch. 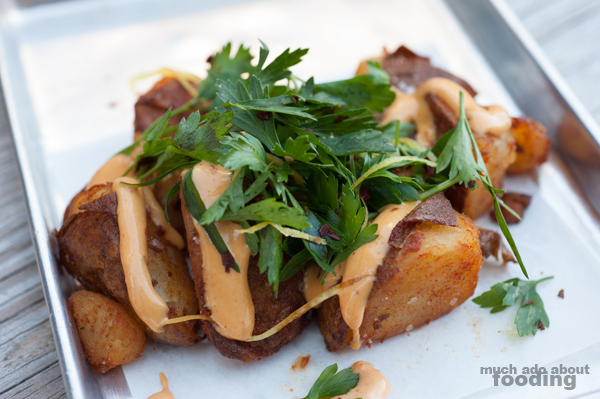 However, all of the seasonings on it were terrific, and the aioli helped give a smooth texture once you got to the starchy centers (can't really avoid the starchiness since potatoes just potate like that...inside joke). 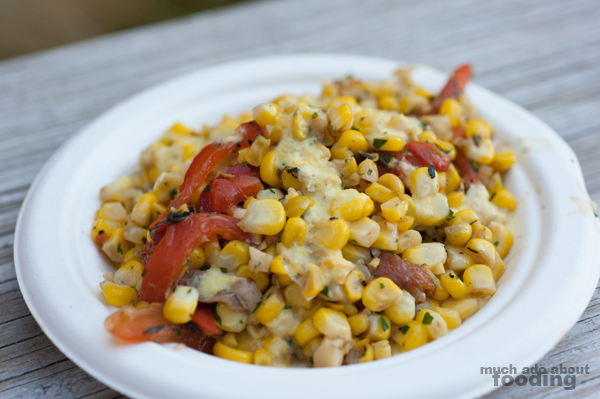 The corn was a riff off of the commonly-known elote but in esquites fashion - yellow summer corn tossed in a myriad of seasonings, vegetables and sauce that made it creamy, sweet, and spicy all at the same time. Now if only it had been grilled or charred just a little longer for a more street food-style taste. It was still very much enjoyable though, and the corn crema was a great touch. Onto the tacos! Seeing as the entire restaurant is built up from this food item, it's hard not to taco 'bout it. There are so many types to choose from (and you can check out the whole menu here) so we tried to narrow it down to a few tacos each. This new menu has brought back the original 6" tortillas that Taco Asylum first opened the restaurant with that customers have been wanting back. 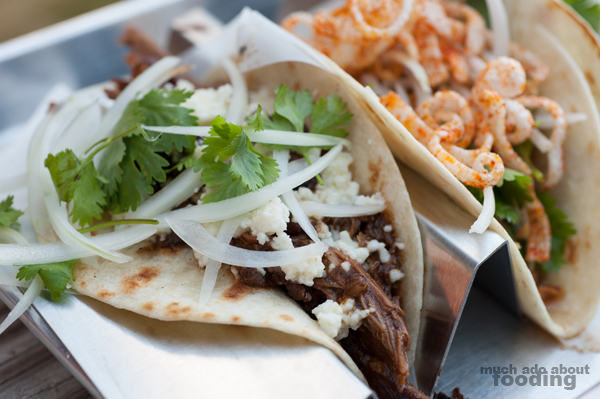 Our first round of three which came out on their stenciled metal taco holders had the Duck Mole ($7.50 - braised duck leg, Oaxacan mole, queso fresco, and salsa crudo), Shrimp Pad Thai ($6.75 - pan-fried shrimp, Thai basil, crushed peanuts, onion, sprouts, crispy rice noodle, and red Thai chili), and Mushrooms and Brie ($5.75 - garlic, white wine, parsley, lemon, crushed red pepper, and magic). Chef Carlos was especially proud of the duck mole taco and with good reason; this one derived from a family recipe that he was seeking to execute the right way. It was sweet but not overbearingly so like some mole sauces can be, and the duck was tender and moist. It had the warm comforts of a family meal to it. 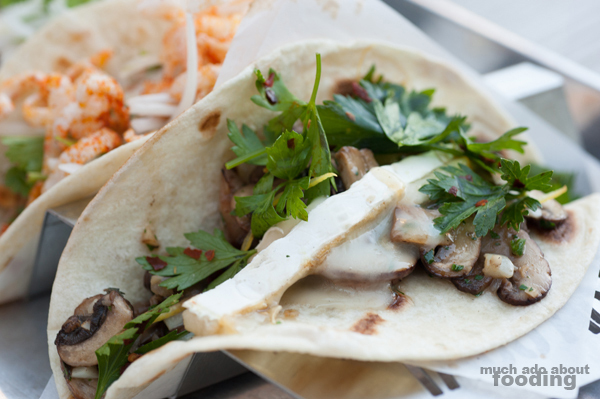 My favorite taco of the night (from the regular menu) was the Pad Thai which I had been extremely curious about. How could someone make a taco from a traditional noodle dish? When I saw it all composed together, however, I completely understood; the signature Pad Thai sauce enrobed the perfectly cooked shrimp and nestled at the bottom of a taco topped with plenty of fresh crispies and vegetables. As for the mushrooms and Brie, I'll admit that I did not personally taste it so cannot give my own perspective on it but everyone else who had one seemed to very much enjoy the umami mixed with melty, soft cheese. The next round of tacos were the Wasabi Shrimp ($6.75 - tempura shrimp, puffed rice, ginger, sweet chili sauce, and wasabi cream), Fried Chicken ($5 - buttermilk-fried chicken, watermelon-Feta salad, fresno chili hot sauce, and crispy herb salad), and Chef's Prescription (market price). The last listed is a rotating special chosen by Chef Carlos based on the availability of unique meats and produce that he procures for one-time only tacos. These were just six of their many, many tacos including menu sections for Classic Tacos such as carnitas and pollo and Vegetarian Tacos which included the mushrooms taco and past favorite, the paneer taco. 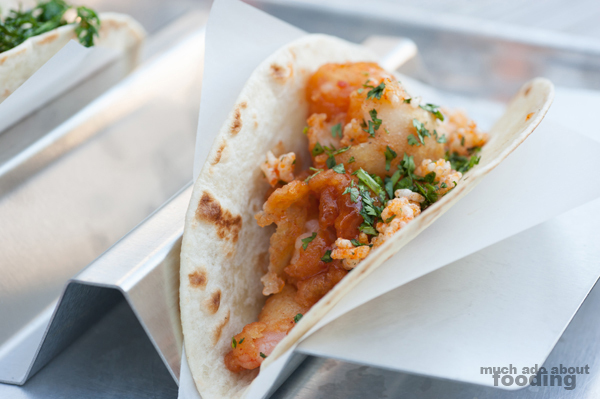 The wasabi shrimp taco was similar to the Pad Thai because of the tempura shrimp and the sweet chili sauce (not quite Pad Thai but still had the same flavor profiles) so we really liked this one as well. The puffed rice contributed a crunchy element to the otherwise soft innards; the sauce had drowned the fried hardness of the tempura into a softer, soggier shell. What seemed strange and ended up shocking us though was that the wasabi was not as evenly distributed as it could have been so large chunks were eaten at some bites and not others. One taco I could see being immensely popular or at the very least, tried a lot, is the fried chicken. 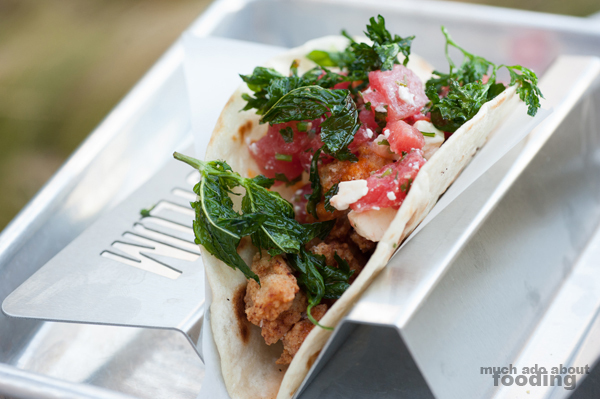 Because fried chicken itself is an item that people tend to flock to already, the idea of putting it in a taco would be appealing and the fans will not be disappointed. The pieces border on being popcorn chicken-like, most probably due to the taco component and needing to be eaten in small bites. The sweet chill of watermelon on top of the hefty batter crunch played a fun contrast with every mouthful, especially paired with the slight heat of the hot sauce. This was excellently composed. Last but certainly not least was the rotating taco selection. For this tasting, it ended up being my absolute favorite but I was disappointed to see that it would be one-time only. 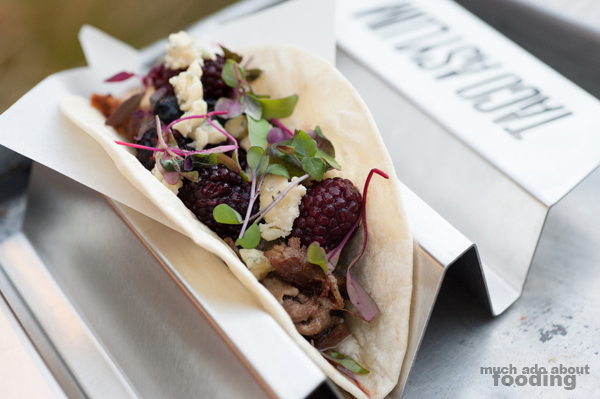 Chef Carlos had put together a Head Cheese taco with Dijon, Bleu cheese, and a blackberry-blueberry Cabernet sauce. It was so fatty and succulent that I did not share my whole taco. The elements of dark berries reduced with Cabernet really brought forward the meat's inherent sweetness, and all of that was cut by the funk of Bleu cheese but not too drastically. It was a genius combination. At this point, we were quite stuffed but Taco Asylum finally added a section to their menu not previously present - dessert! We all know that that is a separate stomach though so we were able to get some bites in. The two available are their Dessert Nachos ($7 - cinnamon-chili-sugar-orange zest-dusted tortilla chips, Mexican hot chocolate sauce, and red chili creme anglaise) and Churro Bites ($7 - Mexican donuts rolled in cinnamon and sugar with dulce de leche), both proud creations by Chef Carlos and truly demonstrating his influence on the direction of the menu. 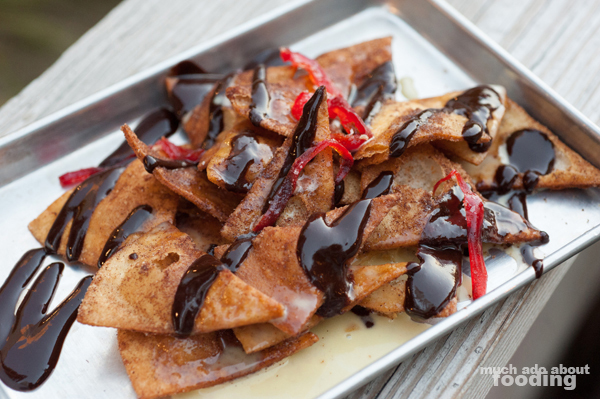 The dessert nachos were decadent and well paired with the candied chilis on top. 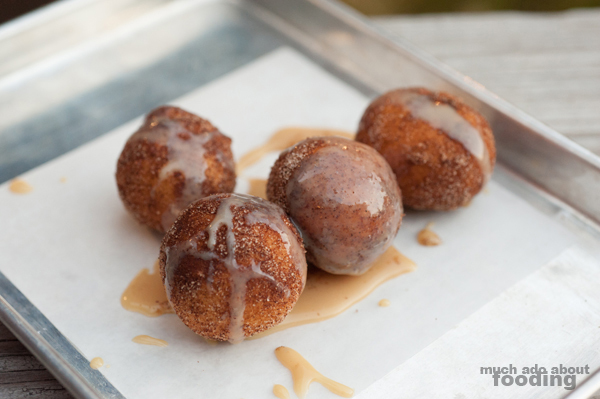 Those who love a bit of chocolate but more of the sugary, zesty desserts will really enjoy the nachos but those who just want a doughy dessert should opt for the churro bites. Dense and endearingly bite-sized, these churro pieces were fun to share with others. 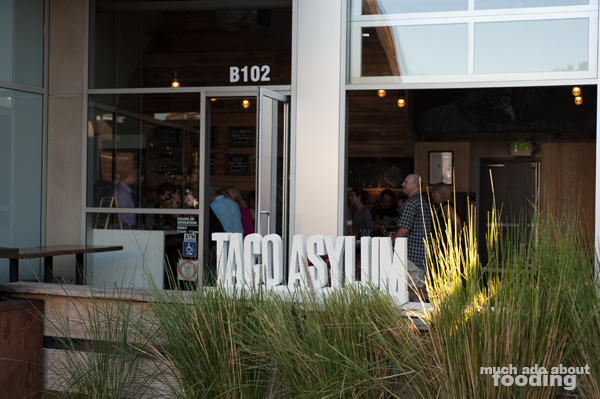 Taco Asylum has graciously offered a chance for readers of Much Ado About Fooding to try their tacos for free! 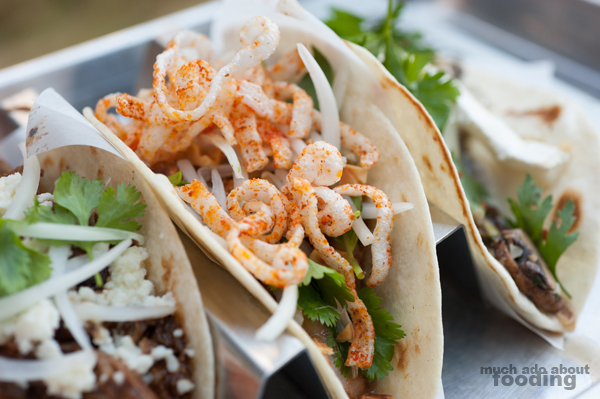 Three lucky winners will get a free meal at Taco Asylum of Two (2) tacos of choice + one (1) dessert of choice! All you have to do to participate is enter in the widget below. Since they have so many taco choices to taste, we highly recommend that you turn your win into a date night or just a fun day out with friends. Make sure to spend some time afterward to explore the other spots at The Camp, shopping for clothes and jewelry, tasting wine, or even getting some baked goods to go. After all, why wouldn't you want to get a little bit of everything? They're all so tasty. More giveaway details are below - good luck! The giveaway will run until 8/11/14 at 11:59pm PST. Winners will be contacted upon winning and have 48 hours to respond before runner-up winners are drawn.